Acrid Buttercup in the people is called "blindness". Its poisonous juice, according to legend, is able to dazzle poultry, if she accidentally eats any part of this plant. But there is another explanation for this names: the man in the eye that gets this burning fluid, can temporarily lose vision. This plant with yellow flowers is a honey plant. In addition, it has long been used by healers in folk medicine. As mustard, its leaves are used for treatment of pulmonary diseases. 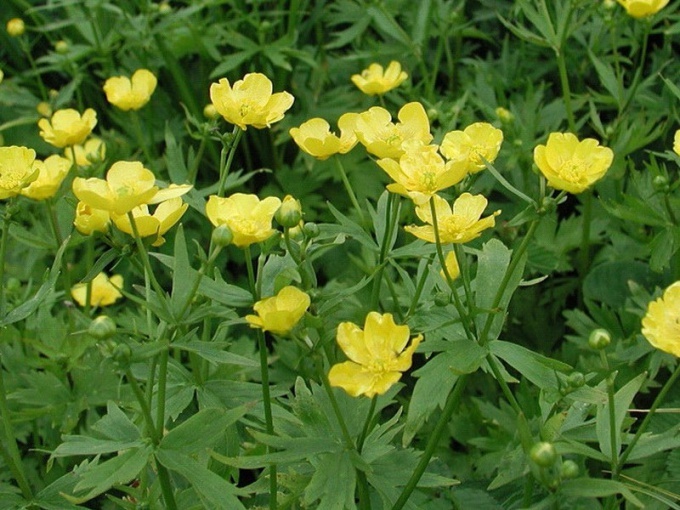 Due to antiseptic and protivopolojnym properties protoanemonin the main active substance contained in the plant, Buttercup was used externally for burns, cuts and boils as a compress. In medieval Europe, night blindness was a traditional remedy for warts, and its antiseptic and warming effect helps in the treatment of gout and rheumatism. It was also found detrimental effects of plants on scabies. A decoction of the dried leaves and stems of Ranunculus were used for relieving head and stomach pain with neuralgic nature. Due to the high content of ascorbic acid, glycosides, saponins, tannins, and the plant asparagine stimulates the Central nervous system, and also contributes to the increase in the number of red blood cells, which led to the effective application of acrid Buttercup in treating all kinds of anemia. The toxic effect of small doses of the herb night blindness is expressed as a mild form of poisoning, upset stomach. This property of dandelion was used to solve strong constipation. Later physicians have found that it is a poisonous plant can be effectively used as adjuvant therapy in the treatment of tuberculosis. Despite the apparent harmlessness and availability of medicinal properties, acrid Buttercup – the plant is poisonous and extremely dangerous. For example, the accidental ingestion of fresh leaves and flowers often lead to disease and even the decline of cattle. Acrid juice, when applied to the skin can cause severe burns – up to the formation of blisters and necrosis of cells. Strong irritant effect dandelion has on mucous membranes of the stomach and intestines. Acute poisoning accompanied by severe pain and damage to the heart. Modern official medicine is strictly against the use of acrid Buttercup in therapeutic practice, therefore, to recommend for night-blindness for the treatment of a disease means to endanger the health and life of man.